In recent years, we’ve seen a flood of electric shavers hit the market. The men’s grooming world has recently been abuzz with crafting some of the best consumer-grade trimmers and shavers that we’ve ever seen, but today we’re going to be talking about options for the best electric shaver for barbers. The professional men’s grooming market is just as if not more important than the consumer variant. Ensuring that barbers around the world are outfitted with the best tools possible is critical to their ability to offer sleek and stylish haircuts to all walks of guys, but seeking out the best of the best in a mess of shavers is something that most barbers simply don’t have time for. We get and understand that, so we’ve decided to help our fellow barbers out. We’ve scoured the World Wide Web for the best barber electric shavers, and after plenty of digging and searching, these are the 5 stand out picks that you need to rock! 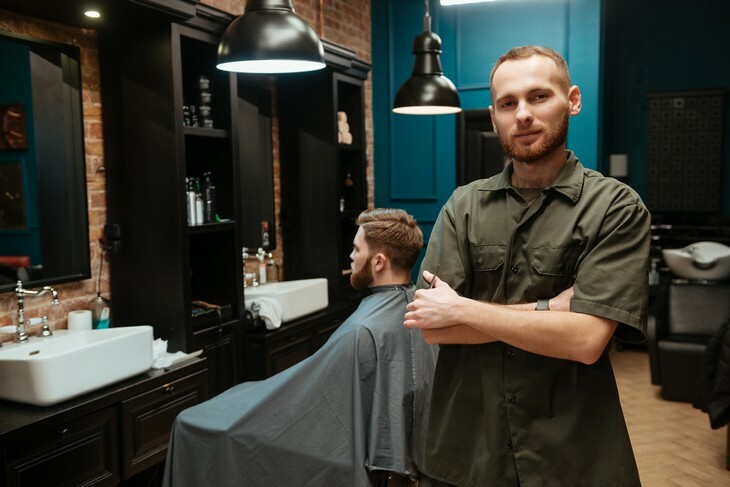 Oster may not be a name that all men are familiar with, but if you’re a guy who carriers the barber title, chances are you’ve come across your fair share of Oster products over the years. The Oster Fast Feed Adjustable Pivot Motor Clipper is quickly becoming a favorite for barbers everywhere, and a quick look at the product will easily reveal why this is. The Fast Feed has the awesome ability to smoothly cut through dry and wet hair alike, and the ergonomic-designed body means that your hand won’t ever cramp up while using the thing. The red color is also rather attractive, but you can also opt to get the Fast Feed in a pink or silver flavor as well. Bundled with Oster’s Fast Feed are four guide combs to help you get the perfect cut every time, a blade guard, and a free cleaning brush and oil to lubricate the blades. It would have been great to have wireless capability, but the 8-foot cord offers more than enough room for pretty much all scenarios. Click here to read more about Oster Fast Feed Motor Clipper on Amazon. Next up is the Wahl Color Pro Complete Hair Cutting Kit, and this is by far the most affordable option you’ll find on this list. You don’t necessarily want to skimp out too much when looking at shavers for barbers, but Wahl has done a fantastic job at providing a ton of power and features for a fraction of the cost. There are eight combs that come with the Wahl, and the multi-colored nature of them makes it dead simple to remember the exact length of each one. This is definitely a very simple feature, and while it might sound silly on paper, it’s actually quite useful when put to the test in the real world. These colored-combs work nicely with the buttons found on the Wahl that are also multi-colored, and all of this comes together to create for a very seamless experience while using the trimmer. The carbon steel blades included with the Color Pro are self-sharpening to ensure many years of solid, constant use, and the body features a soft-touch grip that makes wielding the Color Pro an absolute joy. You may not get quite as much power with the Wahl Color Pro as its competitors, but you simply cannot beat it if you’re looking for a reliable barber shaver that’s as affordable as possible. Click here to read more about Wahl Color Pro Hair Cutting Kit on Amazon. Love the Wahl brand but looking for something that’s a bit more premium? Check out the Wahl Lithium Ion Clipper. Whereas the Color Pro is limited to being used while plugged into the wall, you can choose to use the Ion Clipper completely wireless with a run-time of 2 hours on just one charge. In addition to the added functionality with the wireless capabilities, this Wahl trimmer also gets an edge over the Color Pro with it’s more powerful and precise blades. These ones are also self-sharpening, but they also promise to deliver snag-free cuts and but hair around 40-percent faster than lower-end Wahl models (e.g. the Color Pro). Click here to view Wahl Lithium Ion Clipper on Amazon. If money really isn’t any object to you and you just want the absolute best electric shaver for barbers, few items will satisfy you as much as the Andis Professional Ceramic Hair Clipper will. This Andis clipper can be used without any sort of wires or cords just like the Wahl Lithium Ion Clipper, and a full battery will provide you with one full hour of use time. The blades can easily be detached from the Andis Professional to create for very easy cleanup, and this also allows you to easily pop on any of Andis’ Ultraedge and Ceramicedge blades — some of the finest the professional men’s grooming industry has to offer. The rotary motor kicks out quite a bit of power, and the included blades that come out of the box with the Andis Professional deliver a really accurate and precise cut. However, as great as the bundled ones are, the real star of the show here is the ability to upgrade to those higher-end blades at some point in the future. This one is definitely the biggest investment out of all the other blades on the list. Click here to read reviews posted about Andis Professional Hair Clipper on Amazon. Going back to the Oster brand, we’ve got the Oster Classic 76 Universal Motor Clipper. While the Fast Feed might be picking up in popularity, few barber shavers are as recognizable as the Classic 76. Along with touting one of the most iconic designs of all the shavers on this list, the Oster Classic 76 comes packed to the gills with features. The single-speed motor is incredibly powerful and is a champ for even the most demanding of tasks. You can use blades sized from 000 up to 1 with the Classic 76, and the free blade guard, cleaning brush, and lubricating oil is just icing on the cake. You’ll get an incredibly durable body to keep the Classic 76 looking as good as new for many years to come, and the 9-foot power cord makes the lack of wireless capabilities a lot less irritating. While barber shavers might not be worlds different than what you get with trimmers that are made for regular consumers, the added power and functionality should be easy to see after going through this list. The shavers we mentioned are easily the best of the best when it comes to pro-grade grooming tools, and any barber should be proud to rock any of these trimmers as their weapon of choice.